﻿We recite the Kshitigarba Sutra in Chinese to pacify devastating and catastrophic earthquakes from happening in California, Nepal, and other places next year. Please see the campaign website for more information about this joint effort by the San Francisco Bay Area FPMT centers. Although virtually unknown in the West, the Sutra of the Past Vows of Earth Store Bodhisattva has been popularly used for centuries in East Asia in the rituals concerned with death and dying. 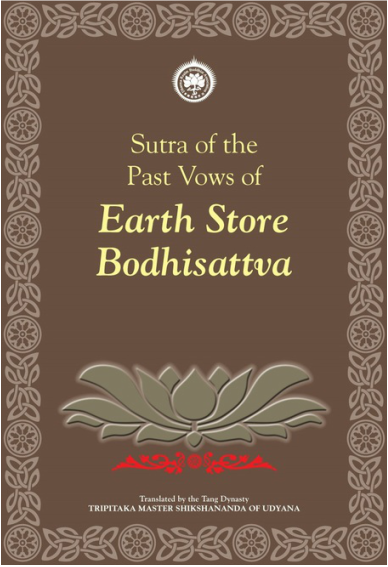 The Earth Store Sutra records various previous lives of Earth Store (Kshitigarbha) Bodhisattva in which he made vows. The first of these stories relates how the bodhisattva was once the daughter of a Brahmin woman who dies and is consigned to the hells for offenses that she has committed in her lifetime. In an act of filial responsibility and respect, the daughter travels to the hells to rescue her mother from its horrors and subsequently vows to rescue all beings who suffer there. The rich descriptions of the kinds of karmic retribution and punishments that the dead suffer in the hells are reminiscent of the Christian hell in Dante’s Inferno.